Blurb: A year after becoming sheriff, Quinn Colson is faced with the release of an infamous murderer from prison. Jamey Dixon comes back to Jericho preaching redemption, and some believe him; but for the victim’s family, the only thought is revenge. Another group who doesn’t believe him – the men in prison from Dixon’s last job, an armoured car robbery. They’re sure he’s gone back to grab the hidden money, so they do the only thing they can: break out and head straight to Jericho themselves. Colson and his deputy, Lillie, know they’ve got their work cut out for them. But they don’t count on one more unwelcome visitor: a tornado that causes havoc just as events come to a head. Communications are down, the roads are impassable – and the rule of law is just about to snap. 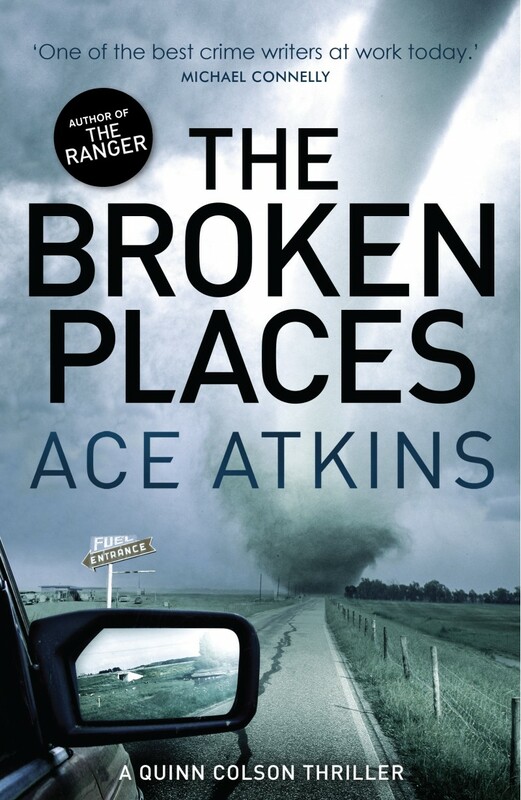 Ace Atkins’ third novel featuring Sheriff Quinn Colson maintains the solid standard of the first two books – The Ranger and The Lost Ones. The book weaves a tale of convicts on the run in search of their hidden loot, and the ex-convict who has turned to Christ and wants to marry Colson’s sister, with the natural disaster of a tornado hitting the town of Jericho. Whilst the story holds no real surprises and unfolds in a similar fashion to the first two books in the series, the added dimension of the storm hitting the community makes for a large scale climax. The family conflict surrounding sister Caddy taking up with seemingly reformed and misunderstood Jamey Dixon, is also a familiar one, but essential to give the story some emotional clout. However, Atkins employs a tight writing style built around a group of strong characters, not least Colson’s support team including Deputy Lillie Virgil and the one-armed Boom. The final showdown is suitably tense and whilst Atkins never scales the heights of Craig Johnson’s Longmire series, this is a perfectly entertaining read on its own terms. Starring: Andy Serkis (Caesar), Jason Clarke (Malcolm), Gary Oldman (Dreyfus), Keri Russell (Ellie), Toby Kebbell (Koba), Kodi Smit-McPhee (Alexander), Kirk Acevedo (Carver), Nick Thurston (Blue Eyes), Terry Notary (Rocket), Karin Konoval (Maurice), Judy Greer (Cornelia), Jon Eyez (Foster), Enrique Murciano (Kemp), Larramie Doc Shaw (Ash), Lee Ross (Grey). Producer: Peter Chernin, Dylan Clark, Rick Jaffa, Amanda Silver; Director: Matt Reeves; Writer: Mark Bomback, Rick Jaffa, Amanda Silver (Based on Characters created by Rick Jaffa, Amanda Silver; Premise suggested by the novel “Planet of the Apes” by Pierre Boulle); Director of Photography: Michael Seresin; Music: Michael Giacchino; Film Editor: William Hoy, Stan Salfas; Production Designer: James Chinlund; Art Director: Naaman Marshall; Set Decorator: Amanda Moss Serino; Costume Designer: Melissa Bruning. 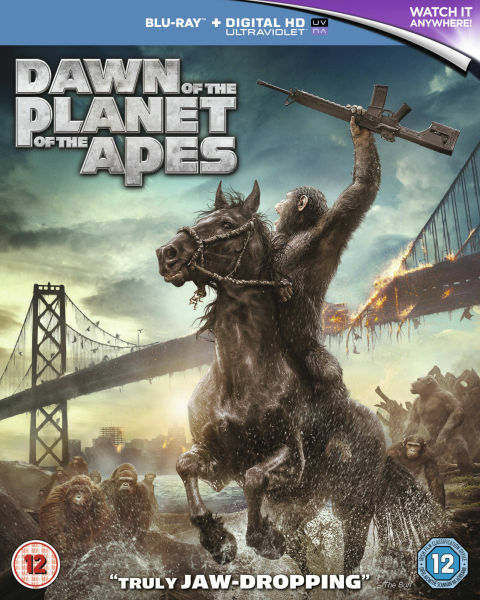 The sequel to RISE OF THE PLANET OF THE APES is a rousing continuation of the franchise. Ten years after a pandemic disease seen in that film, the apes who have survived are drawn into battle with a group of human survivors who seek to restore power to the city of San Francisco. The technical achievements of this film are huge, from the brilliantly conceived apes with CGI mapped over the physical performance of real human actors, to the excellent design work. Andy Serkis is again excellent at conveying Caesar’s internal conflict and a nod should also go to Toby Kebell who as Koba, the rebellious ape carried forward from the first movie where he was played by Christopher Gordon. The human actors are headed up by Gary Oldman, as the leader of the survivors and Jason Clarke as Malcolm, who acts as the bridge between the ape and human colonies. The drama unfolds around the conflict Caesar feels with doing what’s right for his ape colony and keeping relations with the humans harmonious. Eventually Koba rebels and, believing he has killed Caesar, leads the apes in an attack on the human colony in a spectacular action sequence which sees the apes take control. However, Caesar has survived and Malcolm helps him restore contact with his son and together they try to put a stop to Koba’s rule. There are nods to the films roots, notably in the character names Blue Eyes (the nickname given to Charlton Heston in the original) and Maurice (the first name of the actor Maurice Evans who played Dr. Zaius in the same 1968 film). The plot resembles that from the fifth film in the original series BATTLE FOR THE PLANET OF THE APES, but at least this time they have the budget. Whilst there are moments of pure Hollywood in some of the plotting, by sheer achievement of its ambition in providing intelligent escapist entertainment this is a refreshingly successful addition to the effects driven blockbusters crowding cinemas. Credit goes to director Matt Reeves for giving the story room to breathe rather than just create a succession of action scenes. A third film is in development and should be well worth the wait. Starring: Aaron Taylor-Johnson (Ford Brody), Ken Watanabe (Dr. Ishiro Serizawa), Bryan Cranston (Joe Brody), Elizabeth Olsen (Elle Brody), Carson Bolde (Sam Brody), Sally Hawkins (Vivienne Graham), Juliette Binoche (Sandra Brody), David Strathairn (Admiral William Stenz), Richard T. Jones (Captain Russell Hampton), Victor Rasuk (Sergeant Tre Morales), Patrick Sabongui (Lieutenant Commander Marcus Waltz), CJ Adams (Young Ford). Producer: Bob Ducsay, Jon Jashni, Mary Parent, Brian Rogers, Thomas Tull; Director: Gareth Edwards; Writer: Max Borenstein (Based on a story by Dave Callaham); Director of Photography: Seamus McGarvey; Music: Alexandre Desplat; Film Editor: Bob Ducsay; Production Designer: Owen Paterson; Art Director: Grant Van Der Slagt; Set Decorator: Elizabeth Wilcox; Costume Designer: Sharen Davis. Unlike Roland Emmerich’s 1998 version this is a straight remake of the 1954 Japanese monster movie classic. Here, the world’s most famous monster is pitted against malevolent creatures who, bolstered by humanity’s scientific arrogance, threaten our very existence. The set-up is well paced and promises a much more serious take on the subject. Cranston makes an effective misunderstood professor carrying an earnestness in his performance reminiscent of Harrison Ford. It’s a shame he disappears from the action too early as his character is presented as the focal point of the plot early on. Instead it is Taylor-Johnson, as his soldier son trying to re-unite with his family, who takes centre stage and the film veers into more typical destruction and mayhem. 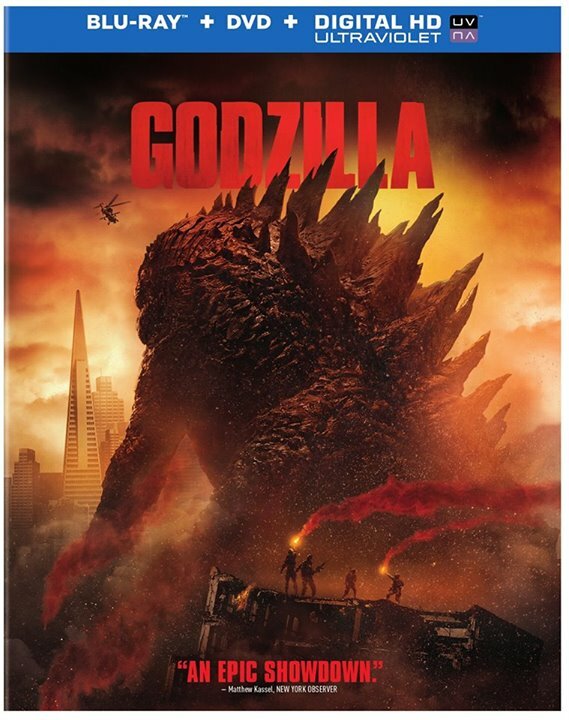 Godzilla is kept off screen for much of the film but some action in Hawaii and then the extended finale in San Francisco, where the creature battles the parasites, provide a showcase for the visual effects team. Action fans will lap up the second half of the movie, whilst those looking for more intelligent film-making will feel slightly disappointed the production team wastes its promising opening by giving over the second half of the movie to technicians. 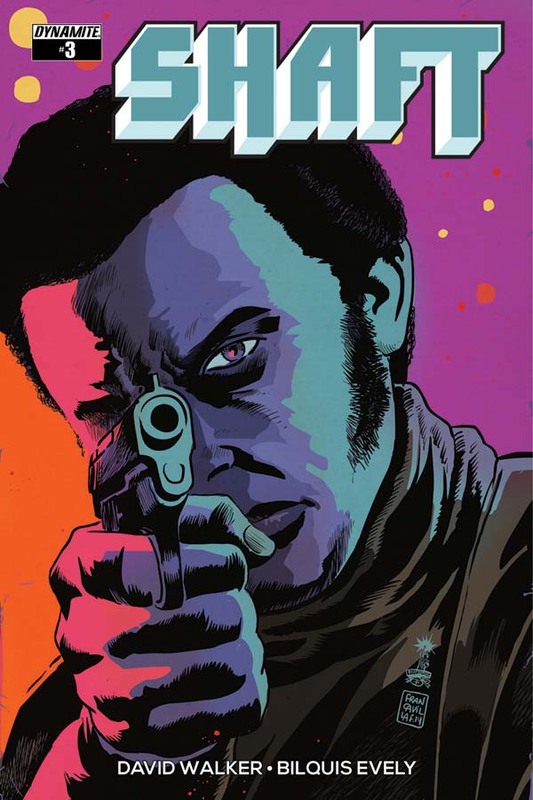 Covers by Francesco Francavilla and Sanford Greene for the third issue of Dynamite’s Shaft comic book series written by David Walker and due out on 4 February 2015 have been released. Blurb for the issue gives an exciting summary of the plot: Devastated by the murder of a friend, Shaft wants answers and revenge-though not necessarily in that order. With vengeance on his mind and cold steel in his hand, Shaft finds himself caught up in a brewing gang war that threatens to consume the city. Everyone from the Mafia to the police wants Shaft to do their dirty work, but no one realizes that’s all part of his plan. 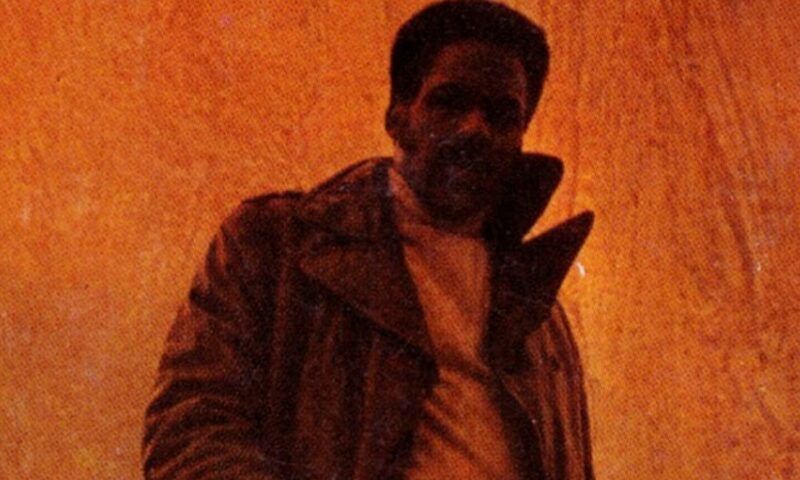 Each of Dynamite Entertainment’s six Shaft comic books penned by David F. Walker will contain a download link, via a QR reader, to a short novel by Walker entitled Shaft’s Revenge. This is the first original prose work to feature Ernest Tidyman’s creation since the original books went out of print in the late 1970s. As yet there are no details of plot or setting, but Walker’s desire to portray his Shaft in line with the character seen in Tidyman’s novels suggests fans of the books are in for a treat. 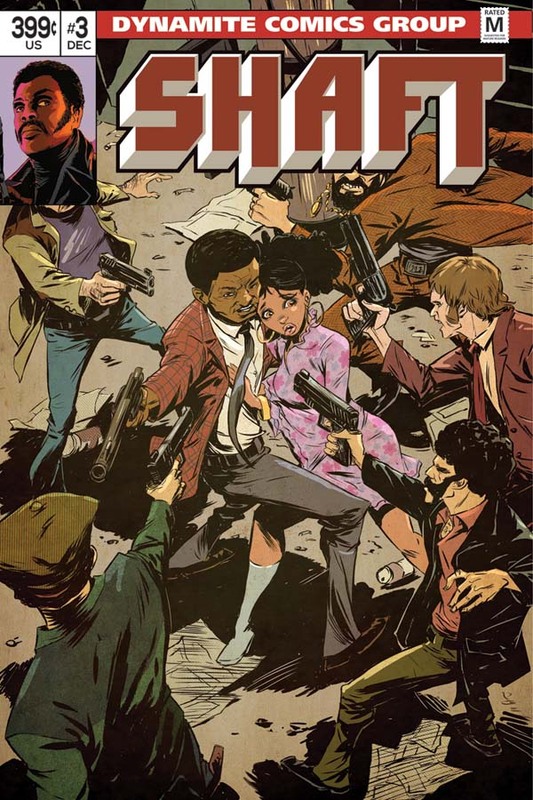 Shaft #1 comic book is on sale on 3 December 2014 and #2 on 14 January. Google have published preview pages from Shaft #1 in their Books section. Denys Cowan has published cover art he has worked on with Bill Sienkiewicz for Dynamite Entertainments second issue of Shaft, their new comic book series based on Ernest Tidyman’s novels. Issue #2 goes on sale on 14 January 2015. 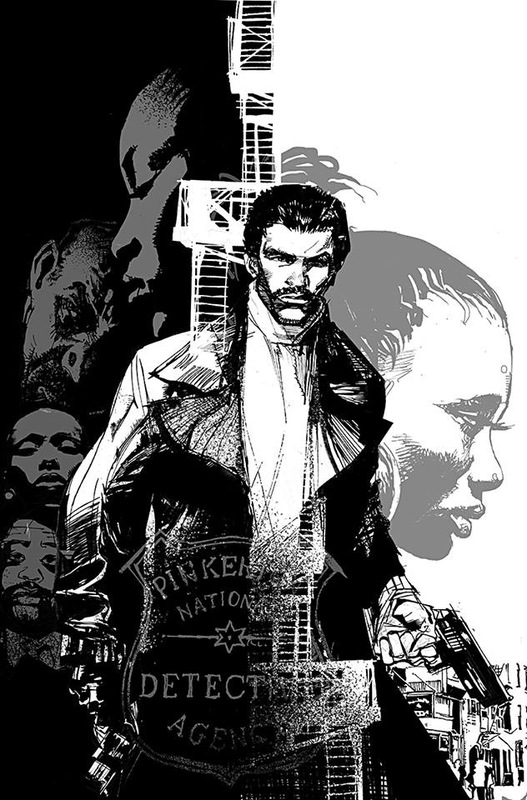 Cover art for Shaft #2 by Denys Cowan and Bill Sienkiewicz. Starring: Alec Newman (Rob), Ed Speleers (Ed), Melissa George (Alison), Kate Magowan (Jenny), Garry Sweeney (Alex), Holly Boyd (Anna), Douglas Russell (Hunter 1), Alan Steele (Hunter 2), Sean Harris (Mr. Kidd), Stephen McCole (Mr. Mcrae), Karel Roden (Darko), Eamonn Walker (Andy), Paul Anderson (Chris), Eric Barlow (Sergeant Gray), Jamie Edgell (House Owner), Mathew Zajac (Mr. Rakovic). Producer: Michael Loveday; Director: Julian Gilbey; Writer: Julian Gilbey, Will Gilbey; Director of Photography: Ali Asad; Music: Michael Richard Plowman; Film Editor: Julian Gilbey, Will Gilbey; Production Designer: Matthew Button; Art Director: Daniela Faggio; Set Decorator: Cathy Featherstone; Costume Designer: Hayley Nebauer. The Gilbey brothers have written a neat little B-movie thriller, which makes effective use of its Scottish Highland setting. The story surrounds a group of mountaineers who discover a kidnapped girl buried underground and are pursued by her captors. The girl’s father has hired a group of mercenaries to retrieve her and when the three groups converge on a remote Scottish village in the middle of a Paegan festival a blood bath starts. The mountain climbing scenes are authentically captured by director Julian Gilbey and the chase scenes on the mountain are gripping as the climbers and the girl are pursued by the kidnappers. The action in the closing village scenes is brutal and the whole thing becomes little more than a bloodbath in its finale. Characterisations are also in short supply, with the actors merely being cyphers for the plot. But the camerawork is excellent and the tension is maintained throughout. A good example of using location and editing to get the best out of a slight story on a limited budget. 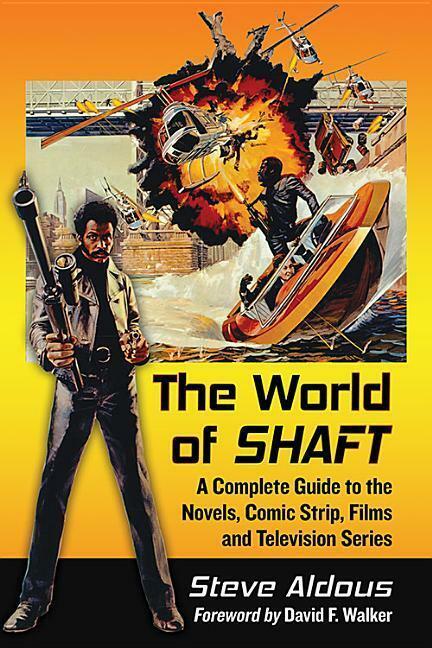 Dynamite Entertainment have updated their site promoting the first edition of the Shaft comic book, due to be published on 3 December 2014. The sample panels show Shaft in a boxing bout and also flashbacks to his service in Vietnam. Starring: Peter Capaldi (The Doctor), Jenna Coleman (Clara Oswald). Executive Producer: Steven Moffat, Brian Minchin; Producer: Nikki Wilson, Peter Bennett; Music: Murray Gold. Peter Capaldi is the most alien Doctor since the series returned to our screens in 2005. He produces a well-judged performance keeping the balance between eccentric humour and gravitas, something that could not be said of many of Matt Smith’s later stories where the humour began to take over. Capaldi’s age also helps give the Doctor a more authoritative presence. Jenna Coleman embraces the new dynamic and rises to the occasion to produce her best performances of her tenure. The addition of Samuel Anderson as her love interest, teacher and former soldier Danny Pink, ensures she remains a central focus throughout the series. The plot umbrella involving the mysterious Missy (played with almost pantomime like relish by Michelle Gomez) led to a two-part finale that attempted to cram in too many emotional thumps. In general, however, the stories are of the most consistently high quality since Matt Smith’s debut season with the most successful of them going back to the basics of what makes this show the most enjoyable thing on television. 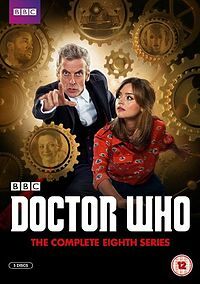 Starring: Peter Capaldi (The Doctor), Jenna Coleman (Clara), Neve McIntosh (Madame Vastra), Dan Starkey (Strax), Catrin Stewart (Jenny Flint), Peter Ferdinando (Half-Face Man), Paul Hickey (Inspector Gregson), Tony Way (Alf), Maggie Service (Elsie), Mark Kempner (Cabbie), Brian Miller (Barney), Graham Duff (Waiter), Ellis George (Courtney Woods), Peter Hannah (Policeman), Paul Kasey (Footman), Michelle Gomez (Missy [The Gatekeeper of the Nethersphere]), Matt Smith (The Eleventh Doctor). Director: Ben Wheatley; Writer: Steven Moffat. When the Doctor arrives in Victorian London, he finds a dinosaur rampant in the Thames and a spate of deadly spontaneous combustions. Who is the new Doctor and will Clara’s friendship survive as they embark on a terrifying mission into the heart of an alien conspiracy? The Doctor has changed. It’s time you knew him. A lively, if familiar, adventure with large doses of Moffat’s trademark humorous dialogue and manic energy interspersed with occasional moments of atmosphere and tension. Starring: Peter Capaldi (The Doctor), Jenna Coleman (Clara), Zawe Ashton (Journey Blue), Michael Smiley (Colonel Morgan Blue), Samuel Anderson (Danny Pink), Laura Dos Santos (Gretchen Allison Carlysle), Ben Crompton (Ross), Bradley Ford (Fleming), Michelle Morris (School Secretary), Nigel Betts (Mr Armitage), Ellis George (Courtney Woods), Barnaby Edwards (Dalek [Rusty]), Nicholas Briggs (Voice of Battered Dalek), Michelle Gomez (Missy [The Gatekeeper of the Nethersphere]). Director: Ben Wheatley; Writer: Phil Ford & Steven Moffat. A Dalek fleet surrounds a lone rebel ship, and only the Doctor can help them now… with the Doctor facing his greatest enemy, he needs Clara by his side. Confronted with a decision that could change the Daleks forever he is forced to examine his conscience. Will he find the answer to the question, am I a good man? An interesting mix of elements from the 1966 movie Fantastic Voyage and Series 1’s Dalek episode. This gives Capaldi more room to establish himself as possibly the best Doctor of the new run and certainly the most alien. Starring: Peter Capaldi (The Doctor), Jenna Coleman (Clara), Tom Riley (Robin Hood [Robert, Earl of Loxley]), Roger Ashton-Griffiths (Quayle), Sabrina Bartlett (Quayle’s Ward [Marian]), Ben Miller (The Sheriff of Nottingham), Ian Hallard (Alan-a-Dale), Trevor Cooper (Friar Tuck), Rusty Goffe (Little John), Joseph Kennedy (Will Scarlett), Adam Jones (Walter), David Benson (Herald), David Langham (Guard), Tim Baggaley (Knight), Richard Elfyn (Voice of the Knights). Director: Paul Murphy; Writer: Mark Gatiss. In a sun-dappled Sherwood Forest, the Doctor discovers an evil plan from beyond the stars and strikes up an unlikely alliance with Robin Hood. With all of Nottingham at stake, the Doctor must decide who is real and who is fake. Can impossible heroes really exist? One of two lighter episodes (The Caretaker being the other) that harks back to the Matt Smith era. Capaldi handles the comedy well, but the whole thing feels a little too lightweight. Starring: Peter Capaldi (The Doctor), Jenna Coleman (Clara), Samuel Anderson (Danny Pink / Orson Pink), Remi Gooding (Rupert Pink), Robert Goodman (Reg), Kiran Shah (Figure), John Hurt (The War Doctor). Director: Douglas Mackinnon; Writer: Steven Moffat. When ghosts of past and future crowd into their lives, the Doctor and Clara are thrown into an adventure that takes them to the very end of the universe. What happens when the Doctor is alone? And what scares the grand old man of Time and Space? Listen! The first classic of the Capaldi era is a chilling evocation of bedtime nightmares and proves Moffat still has it in him to produce the scares in a lower budget episode, even if he is once again mining the child psyche to produce them. Starring: Peter Capaldi (The Doctor), Jenna Coleman (Clara), Keeley Hawes (Ms Delphox), Jonathan Bailey (Psi), Pippa Bennett-Warner (Saibra), Mark Ebulue (Guard), Trevor Sellers (Mr Porrima), Junior Laniyan (Suited Customer), Ross Mullan (The Teller). Director: Douglas Mackinnon; Writer: Steve Thompson & Steven Moffat. The Doctor turns bank robber when he is given a task he cannot refuse – to steal from the most dangerous bank in the cosmos. With the help of a beautiful shape-shifter and cyber-augmented gamer, the Doctor and Clara must fight their way past deadly security and come face to face with the fearsome Teller: a creature of terrifying power that can detect guilt. Who’s version for a heist movie is well-played by a game cast, with The Teller a memorable monster creation. Whilst the story doesn’t really go anywhere it has its share of entertaining moments. Starring: Peter Capaldi (The Doctor), Jenna Coleman (Clara), Samuel Anderson (Danny), Ellis George (Courtney Woods), Edward Harrison (Adrian), Nigel Betts (Mr Armitage), Andy Gillies (CSO Matthew), Nanya Campbell (Noah), Joshua Warner-Campbell (Yashe), Oliver Barry-Brook(Kelvin), Ramone Morgan(Tobias), Winston Ellis (Mr Woods), Gracy Goldman (Mrs Woods), Diana Katis (Mrs Christopholou), Jimmy Vee (Skovox Blitzer), Chris Addison (Seb), Michelle Gomez (Missy [The Gatekeeper of the Nethersphere]). Director: Paul Murphy; Writer: Gareth Roberts. The terrifying Skovox Blitzer is ready to destroy all humanity – but worse, and any second now, Danny Pink and the Doctor are going to meet. When terrifying events threaten Coal Hill School, the Doctor decides to go undercover. The better of the two comedic stories in the series. Capaldi really enjoys his undercover role and there is much fun to be had with Vee’s monster. Starring: Peter Capaldi (The Doctor), Jenna Coleman (Clara), Samuel Anderson (Danny), Ellis George (Courtney), Hermione Norris (Lundvik), Tony Osoba (Duke), Phil Nice (Henry), Christopher Dane (McKean). Director: Paul Wilmhurst; Writer: Peter Harness. In the near future, the Doctor and Clara find themselves on a space shuttle making a suicide mission to the Moon. Crash-landing on the lunar surface, they find a mining base full of corpses, vicious spider-like creatures poised to attack, and a terrible dilemma. When Clara turns to the Doctor for help, she gets the shock of her life. Beautifully filmed episode that wracks up the tension through its claustrophobic setting. The spider creatures are truly terrifying, but the pay-off solution stretches credulity. However the coda between Capaldi and Coleman packs an emotional wallop. Starring: Peter Capaldi (The Doctor), Jenna Coleman (Clara), Samuel Anderson (Danny Pink), Frank Skinner (Perkins), David Bamber (Captain Quell), John Sessions (Gus), Daisy Beaumont (Maisie Pitt), Janet Henfrey (Mrs Pitt), Christopher Villiers (Professor Emil Moorhouse), Foxes (Singer), Jamie Hill (Foretold). Director: Paul Wilmhurst; Writer: Jamie Mathieson. The Doctor and Clara are on the most beautiful train in history, speeding among the stars of the future – but they are unaware that a deadly creature is stalking the passengers. Once you see the horrifying Mummy you only have 66 seconds to live. No exceptions, no reprieve. As the Doctor races against the clock Clara sees him at his deadliest and most ruthless. Will he work out how to defeat the Mummy? Start the clock! Another race against the clock scenario (previously done in 42) but made with such style, grace and wit you can forgive its contrivances. The mummy creature is a brilliantly realised effect. Starring: Peter Capaldi (The Doctor), Jenna Coleman (Clara), Samuel Anderson (Danny), John Cummins (Roscoe), Jessica Hayles (PC Forrest), Joivan Wade (Rigsy), Christopher Fairbank (Fenton), Matt Bardock (Al), Raj Bajaj (George), James Quinn (Bill), Michelle Gomez (Missy). Director: Douglas Mackinnon; Writer: Jamie Mathieson. Separated from the Doctor, Clara discovers a new menace from another dimension. But how do you hide when even the walls are no protection? With people to save and the Doctor trapped, Clara comes up against an enemy that exists beyond human perception. Brilliantly conceived and executed with some chilling moments and some fun with the Doctor trapped in a shrunken TARDIS. Again an example of the series working best when the budgets are limited. Starring: Peter Capaldi (The Doctor), Jenna Coleman (Clara), Samuel Anderson (Danny), Abigail Eames (Maebh), Jaydon Harris-Wallace (Samson Jaydon Harris-Wallace), Ashley Foster (Bradley), Harley Bird (Ruby), Michelle Gomez (Missy), Siwan Morris (Maebh’s Mum), Harry Dickman (George), James Weber Brown (Minister), Michelle Asante (Neighbour), Curtis Flowers (Emergency Service Officer), Jenny Hill (Herself), Kate Tydman (Paris Reporter), Nana Amoo-Gottfried (Accra Reporter), William Wright-Neblett (Little Boy), Eloise Barnes (Annabel). Director: Sheree Folkson; Writer: Frank Cottrell Boyce. One morning, in every city and town in the world, the human race wakes up to face the most surprising invasion yet. Everywhere, in every land, a forest has grown overnight and taken back the Earth. It doesn’t take the Doctor long to discover that the final days of humanity have arrived. A story where its ambitions outweigh its resources. There are some good moments here too, despite the over-reaching concept and Capaldi has settled nicely into his stride. Starring: Peter Capaldi (The Doctor), Jenna Coleman (Clara), Samuel Anderson (Danny), Michelle Gomez (Missy), Ingrid Oliver (Osgood), Jemma Redgrave (Kate Lethbridge-Stewart), Sanjeev Bhaskar (Colonel Ahmed), Chris Addison (Seb), Andrew Leung (Doctor Chang), Bradley Ford (Fleming), Antonio Bourouphael (Boy), Joan Blackham (Woman), Sheila Reid (Gran), Jeremiah Krage (Cyberman), Nicholas Briggs (Voice of the Cybermen), Nigel Betts (Mr Armitage), Shane Keogh-Grenade (Teenage Boy), Katie Bignell (Teenage Girl), James Pearse (Graham), Nick Frost (Santa Claus). Director: Rachel Talalay; Writer: Steven Moffat. In the mysterious world of the Nethersphere, plans have been drawn up. Missy is about to come face to face with the Doctor, and an impossible choice is looming. “Death is not an end” promises the sinister organisation known only as 3W – but, as the Doctor and Clara discover, you might wish it was. The set up in Dark Water is intriguing and echoes Revelation of the Daleks’ black humour. The cliffhanger reveal is not a surprise, however, and the final episode is overblown, contrived and confusing. There are too many convenient plot resolutions for comfort here, but the final scene between Capaldi and Coleman is perfectly judged. 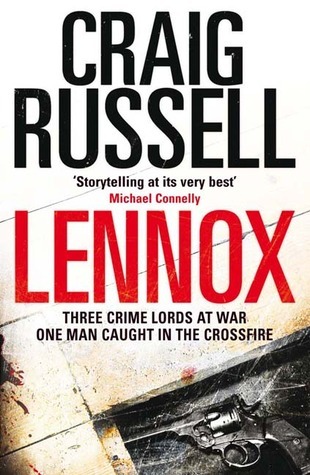 Blurb: Lennox is looking for legitimate cases – anything’s better than working for the Three Kings, the crime bosses who run Glasgow’s underworld. So when a woman comes into his office and hires him to follow her husband, it seems the perfect case. And, unusually for Lennox, it’s legal. But this isn’t a simple case of marital infidelity. When the people he’s following start to track him, once more Lennox must draw on the violent, war-damaged part of his personality as he follows this trail of dead men and broken hearts. 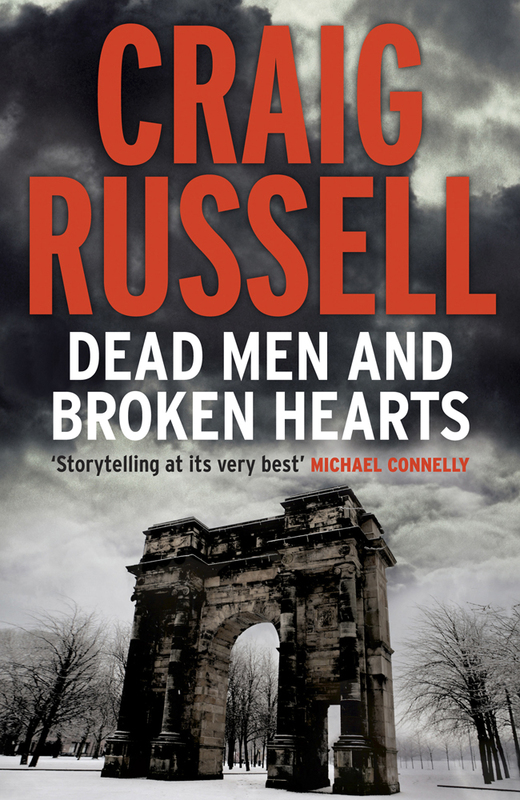 This is the fourth in Craig Russell’s series about Glasgow enquiry agent Lennox (no first name). Whereas the first three were largely confined to the smog-ridden streets of Glasgow in the 1950s, this time Lennox is involved in two cases with deep plots of subterfuge. The broadening of scope not only extends to the plot but to the setting as we follow Lennox to the Highlands in the book’s latter stages. Lennox is an interesting character, haunted by his deeds in the war, he is a carefree character, who is beginning to understand the need to have roots and the comfort that can be gained from a steady relationship. But things change in his life that force him to consider returning to his native Canada. But not before he is framed for murder and has to escape police custody in order to clear his name. The plot elements may sound familiar, but the first-person narrative, again familiar in the genre, is put to good use to create an real sense of mystery around the Hungarian connection and the use of the plot McGuffin being the mystery surrounding a dying man’s last word, “Tanglewood”, is not only pure Hitchcock but evocative of the last James Bond movie, Skyfall. This is the strongest book in what has been a consistently entertaining, if not overly original, series. I hope this isn’t the last we see of Lennox, although there seems to be a certain amount of finality about the epilogue that suggests it may be. LENNOX (2009, Quercus, 426pp) ∗∗∗∗∗ Blurb: Glasgow has always been a tough city and it’s getting tougher. Three crime bosses control the mean streets and shady investigator Lennox is the man in the middle. Lennox can be certain of only one thing – in this place only the toughest survive. The McGahern twins are on the way up until Tam, the brains of the outfit, becomes the victim of a vicious contract killing. Tam’s brother Frankie looks to Lennox to find out who killed his twin. Then Frankie turns up dead, and Lennox finds himself in the frame for murder. To prove his innocence he’ll have to dodge men more deadly than Glasgow’s crime bosses if he hopes to survive. 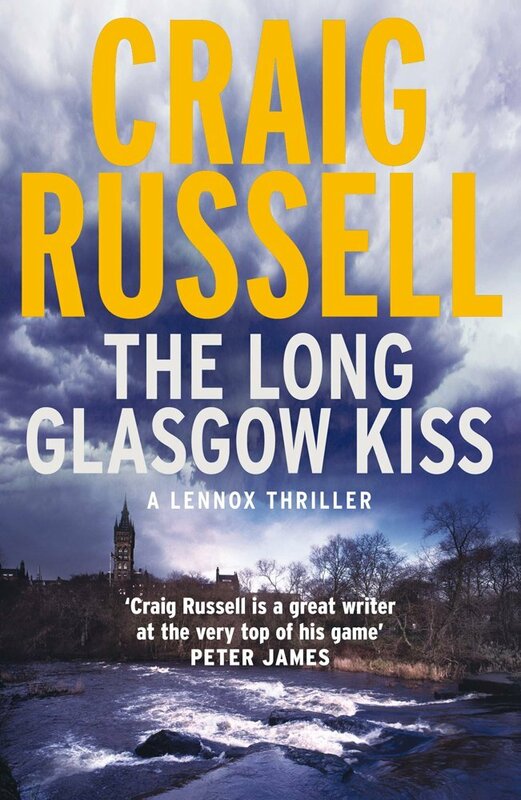 THE LONG GLASGOW KISS (2010, Quercus, 420pp) ∗∗∗∗∗ Blurb: Glasgow in the 1950s – private investigator Lennox is keeping a low profile, enjoying a secret fling with the daughter of shady bookie and greyhound breeder MacFarlane. When MacFarlane is found bludgeoned to death, Lennox is a suspect. Luckily, he has a solid gold alibi – he was in bed with the victim’s daughter. Lennox is quickly drawn into hunting the killer. It turns out MacFarlane was into some seriously dodgy stuff. One of Glasgow’s notorious Three Kings, crime boss Willie Sneddon, is involved and he’s not a man Lennox wants to cross. But there’s an even bigger player lurking in the shadows and it looks like Lennox is going to get his fingers burnt, badly. THE DEEP DARK SLEEP (2011, Quercus, 358pp) ∗∗∗∗∗ Blurb: Human remains are recovered from the bottom of the River Clyde. Not an unusual occurrence, but these have been sleeping the deep, dark sleep for eighteen years. Suddenly Glasgow’s underworld is buzzing with the news that the dredged-up bones belong to Gentleman Joe Strachan, Glasgow’s most successful and ruthless armed robber. Isa and Violet, Strachan’s daughters, hire private investigator Lennox to find out who has been sending them large sums of cash each year, on the anniversary of Strachan’s most successful robbery. But Lennox’s instincts tell him that this job spells trouble and will take him back in to the dark world of the Three Kings – the crime bosses who run the city. He takes the job nevertheless. And soon learns that ignoring his instincts might just cost him his life. This is the third fantastic thriller featuring shady investigator Lennox as he stalks Glasgow’s tough streets. 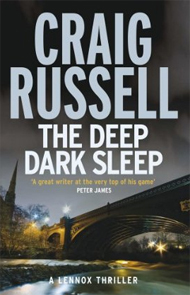 The Deep Dark Sleep is gritty, fast-paced, and totally absorbing.